Renting is all the rage these days, and the tightening of the residential rental market is the biggest threat to inflation, according to Ian Shepherdson, the chief economist at Pantheon Macroeconomics. The logic is simple. When there are few places to rent, landlords will jack up prices. …it’s by far the biggest component of core CPI, accounting for about 40% of the index. 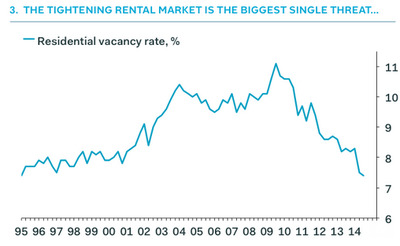 Rents reflect the vacancy rate (very low and falling) and wage growth (very low but about to accelerate, given the drop in unemployment and the pressures evident in surveys like the NFIB) so the risk is substantially to the upside. Rents are much bigger driver of inflation than all the things people think of as indicative of price pressures, like clothing, tech gadgets, prescription drugs, cars, etc. …a sharp and continuing decline explains the gradual upward pressure on rents, which we think are likely ro rise much faster once wage gains begin to pick up. Landlords are likely to be prime beneficiaries of faster wage gains, in our view, because tenants clearly have a shrinking pool of other options. Remember, rents and rent-equivalents account for 40% of the core CPI.